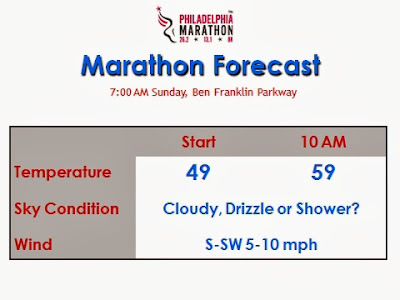 Sunday's Philadelphia Marathon will be a mild run for the "cold" runner out there -- a warm front will push on northeast as we work through Sunday and we should have a a bit of an increase in moisture in the atmosphere. I won't say it'll feel humid out or anything like that but it will not feel anything like it did the past couple of mornings around here. With the advance of a warm front into the region, the prospect for showers or drizzle exists in the Delaware Valley with the inflow of moisture off of the ocean. I doubt it will be an entirely damp morning but the prospect of a few spits of drizzle, or a shower or two, can't be ruled out. We'll update this in the coming day or two as we close in and the finer details can be highlighted. With the advance of warm, more humid air into the region, we'll see temperatures climb through the course of the race into the 50's from a start near 50 degrees in the city. We could even approach 60 by late morning, depending on how quick the warm front pushes in. The good news is that winds will be light, generally around 5 to 10 miles per hour.